It looks like Megalyn Echikunwoke’s appearance on Arrow next week is only the first step for Vixen. According to CW president Mark Pedowitz, the hope is to use a series of small appearances by the character to jumpstart a spinoff. Well, first of all, Legends of Tomorrow is rapidly becoming DC TV’s Island of Misfit toys. It hasn’t even aired yet, but they’re putting every homeless DC character they can find on it. Second, the CW is playing a fascinating game with Vixen. 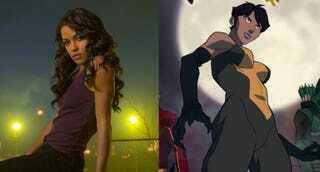 Right now, Vixen lives as an animated series online. The CW’s streaming network is called “Seed,” which is indicative of it’s place as an workshop for potential ideas. It’s similar to the way that Amazon makes its pilots available to the public. It absolves the company of having to make decisions without already knowing how audiences feel. So if Vixen’s second season (and her live action appearance) do well, the CW won’t leave that money on the table. Basically, Pedowitz is saying that if we come, they will build it.